Bird's Eye View, Centennial Buildings, 1876. Fairmount Park, Philadelphia. This is an impressive 1875 view of Fairmount Park, Philadelphia, as seen from far above the Schuylkill River. This view was prepared by H. J. Toudy for the 1876 Centennial International Exhibition and was issued one year before the actual event. The buildings and park grounds were based upon architectural plans and landscape renderings. Nonetheless, multiple buildings are recognizable as are the wide boulevards, fountains, and bridges. The main buildings are identified via a key under the engraving. 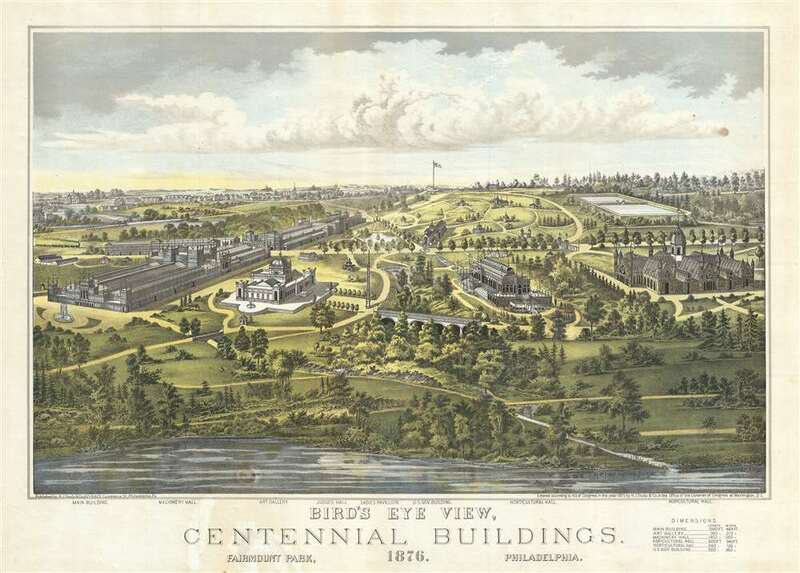 This is one of several separately issued lithographic views of the Fairmount Park and the prepared by Philadelphia commercial engravers to capitalize on the fair's tourist economy. Good. Minor spotting lower left - see image.